The exact purpose of these two embroidered panels is not clear. Each has loops around three sides for fastening to something. They may be intended as sleeve panels, inside the open seam of a man’s doublet or a woman’s jacket or gown as was fashionable in the 1620s. However, other sleeve panels are ovoid shape to fill a similar shape opening in the sleeve. Nor is it clear how and to what the loops on three sides would fasten. The date of the embroidery appears earlier than the 1620s. The simple speckling corresponds to the period 1590 to 1610 during the transition from the geometrical patterns of the 16th century to the shaded speckling of the 17th century. The sleeves of this period were very full at the shoulder tapering to a narrow wrist, with the seams closed. So it is not clear how these panels would have been used in the fashions of 1590 to 1610. 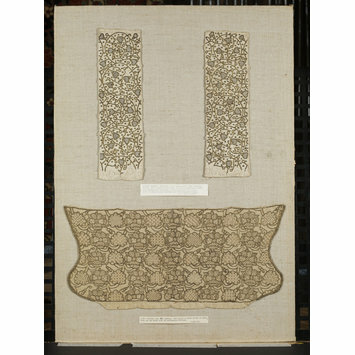 A pair of linen sleeve panels each embroidered with black silk in running stitch and silver-gilt thread in plaited braid stitch and couching with black silk and silver-gilt spangles. 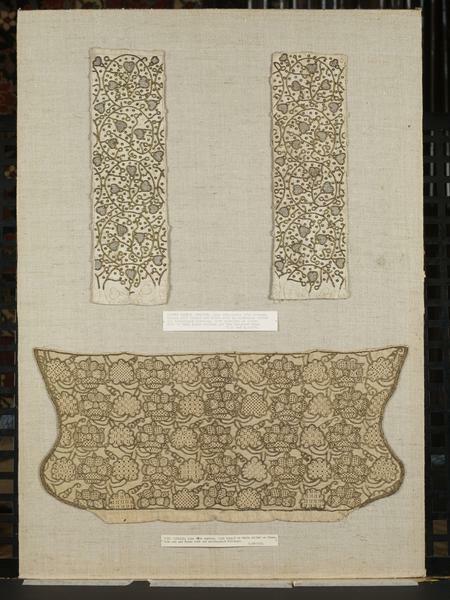 The pattern consists of silver-gilt scrolling stems bearing a heart-shaped flower, possibly peas-blossom, outlined in silver-gilt and black and filled with black silk running stitch. 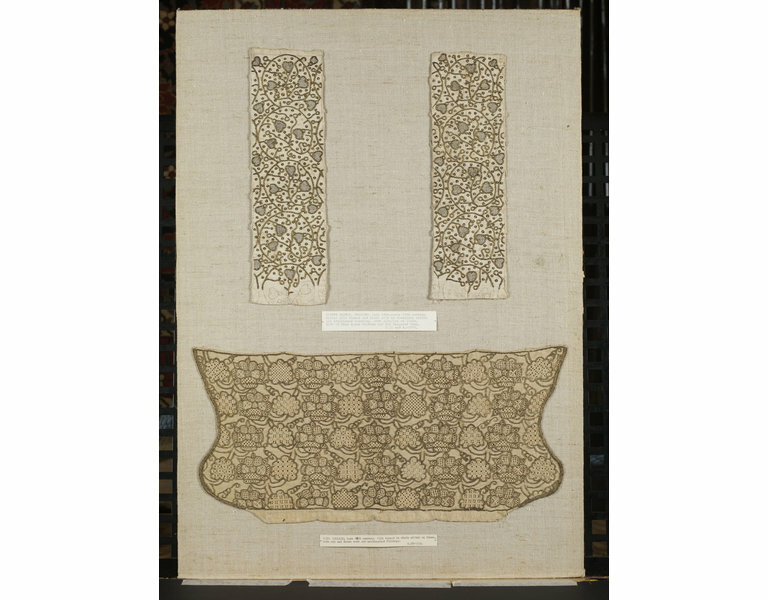 The area of embroidery on each panel is outlined with ink on three sides and the lower edge of each panel left unembroidered (the design drawn in ink still visible). On the three sides of each panel is a series of braided thread bars for laced fastening. The bands are backed with linen and buttonholed fastening loops are attached to all but the bottom edges at intervals. The panels are lined with linen.